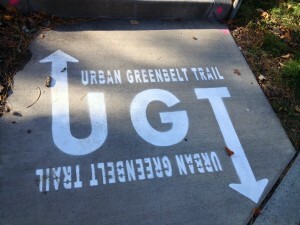 Attending the Washington State Trails Coalition Conference last weekend, I enjoyed a history walk through Richland’s urban greenbelt led by Nancy Doran. The narrated walk embodied what I call a virtual trail, a walk on sidewalks, trails, even through parking lots when a detour was necessary–all connected by a story, the story of Richland’s World War II history. My literary acquaintance with Richland comes through Paul Loeb’s Nuclear Culture and Kathleen Flenniken’s volume of poetry, Plume. This on the ground walk brought more social history into the picture. Richland was a small farming town with only 247 residents when the United States government plucked it and the nearby towns of Hanford and White Bluffs off the map as the perfect place to produce plutonium for the atomic bomb. Farms, homes, and some businesses were forced out in 1943 and housing for 11,000 workers was quickly built. Richland became a bedroom community. We walked past the alphabet homes–built on floorplans A, B, D, E,F or G–with the goal of having high and low income earners living side by side. We saw the site of the women’s dormitories, which anticipated the housing needs of single women workers. We saw the few buildings that preceded the 1940s, the current high school with the Bombers mascot, and a lovely walkway along Hip Deep Creek to the riverfront trail. The Sacajawea Heritage Trail goes for miles along the Columbia River, connecting the Tri-Cities. Much of the architecture along the way reflected the technology and mid-century modern tone of the city. The thoughtful planning of G. Albin Pehrson left parkland as a buffer between homes and businesses, land through which the paved urban trail goes today. For those without a guide, the trail is marked in the sidewalk but volunteer-led history tours are periodically offered through Richland’s Parks and Recreation Department. A brochure by Gary Fetterolf, “Walking Tour of World War II Era Alphabet Homes,” describes the alphabet homes and the origin of street names, named after army engineers. 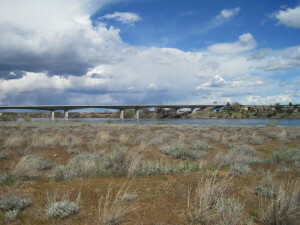 It is available at the new Hanford Reach Museum, a concrete structure rising out of the windswept ground, which broadens the story to the river and the land around it. Hi, Judy! I’d like to know if you (or anyone else around town) would consider planning a tour suited to individuals with limited abilities. I have many older friends and relatives with disabilities who would love to tour with walkers, scooters, wheelchairs, etc., but who wouldn’t be able to keep up with the pace of most tour groups. I’m certain there are loads of folks around town who’d also love to take great tours but who may not be as spry as they used to be. If there isn’t, what can I do to help make this possible? Thanks! That’s a worthy idea. It could happen in many cities in Washington but will depend on local people willing and able to lead tours. I live in Seattle. In Richland, I’d suggest you contact people with the city of Richland. Also this walk is well-marked, paved, and self-guiding. You could plan a tour yourself by checking out the accessibility ahead of time–doing a dry run. Here is a map of trails in Richland. You might also use the brochure on the alphabet houses to lead a tour.